This article is about Hermeticism. For the Argentine heavy metal band, see Hermética. The Hermetica are Egyptian-Greek wisdom texts from the 2nd and 3rd centuries AD, which are mostly presented as dialogues in which a teacher, generally identified as Hermes Trismegistus ("thrice-greatest Hermes"), enlightens a disciple. The texts form the basis of Hermeticism. They discuss the divine, the cosmos, mind, and nature. Some touch upon alchemy, astrology, and related concepts. The term particularly applies to the Corpus Hermeticum, Marsilio Ficino's Latin translation in fourteen tracts, of which eight early printed editions appeared before 1500 and a further twenty-two by 1641. This collection, which includes the Pœmandres and some addresses of Hermes to disciples Tat, Ammon and Asclepius, was said to have originated in the school of Ammonius Saccas and to have passed through the keeping of Michael Psellus: it is preserved in fourteenth century manuscripts. The last three tracts in modern editions were translated independently from another manuscript by Ficino's contemporary Lodovico Lazzarelli (1447–1500) and first printed in 1507. Extensive quotes of similar material are found in classical authors such as Joannes Stobaeus. Parts of the Hermetica appeared in the 4th-century Gnostic library found in Nag Hammadi. Other works in Syriac, Arabic, Armenian, Coptic and other languages may also be termed Hermetica — another famous tract is the Emerald Tablet, which teaches the doctrine "as above, so below". All these are themselves remnants of a more extensive literature, part of the syncretic, intellectualized paganism of their era, a cultural movement that also included the Neoplatonic philosophy of the Greco-Roman mysteries and late Orphic and Pythagorean literature and influenced Gnostic forms of the Abrahamic religions. There are significant differences: the Hermetica contain no explicit allusions to Biblical texts and are little concerned with Greek mythology or the technical minutiae of metaphysical Neoplatonism. However most of these schools do agree in attributing the creation of the world to a Demiurge rather than the supreme being and in accepting reincarnation. Although Neoplatonic philosophers, who quote apocryphal works of Orpheus, Zoroaster, Pythagoras and other figures, almost never cite Hermes Trismegistus, the tracts were still popular enough in the 5th century to be argued against by Augustine of Hippo in the City of God. Seeing within myself an immaterial vision that came from the mercy of God, I went out of myself into an immortal body, and now I am not what I was before. I have been born in mind! While they are difficult to date with precision, the texts of the Corpus were likely redacted between the 1st and 3rd centuries AD. During the Renaissance these texts were believed to be of ancient Egyptian origin and even today some readers believe them to date from Pharaonic Egypt. Since Plato's Timaeus dwelt upon the great antiquity of the Egyptian teachings upon which the philosopher purported to draw, scholars were willing to accept that these texts were the sources of Greek ideas. However the classical scholar Isaac Casaubon (1559–1614) successfully argued that some, mainly those dealing with philosophy, betrayed too recent a vocabulary. Hellenisms in the language itself point to a Greek-era origin. However, flaws in this dating were discerned by the 17th century scholar Ralph Cudworth, who argued that Casaubon's allegation of forgery could only be applied to three of the seventeen treatises contained within the Corpus Hermeticum. Moreover, Cudworth noted Casaubon's failure to acknowledge the codification of these treatises as a late formulation of a pre-existing oral tradition. According to Cudworth, the texts must be viewed as a terminus ad quem and not a quo. Lost Greek texts, and many of the surviving vulgate books, contained discussions of alchemy clothed in philosophical metaphor. And one text, the Asclepius, lost in Greek but partially preserved in Latin, contained a bloody prophecy of the end of Roman rule in Egypt and the resurgence of pagan Egyptian power. Thus, it would be fair to assess the Corpus Hermeticum as intellectually eclectic. More recent research, while affirming the late dating in a period of syncretic cultural ferment in Roman Egypt, suggests more continuity with the culture of Pharaonic Egypt than had previously been believed. There are many parallels with Egyptian prophecies and hymns to the gods but the closest comparisons can be found in Egyptian wisdom literature, which is characteristically couched in words of advice from a "father" to a "son". Demotic (late Egyptian) papyri contain substantial sections of a dialogue of Hermetic type between Thoth and a disciple. Egyptologist, Sir William Flinders Petrie, states that some texts in the Hermetic corpus date back to the 6th century BC during the Persian period. Some similarities between the Demotic texts and Platonic philosophy could be the result of Plato and his followers' having drawn on Egyptian sources. One interesting but unproven claim about the origin of the Corpus Hermeticum is that of B.H. Stricker (1949), according to whom it is a codification of the Egyptian religion. Ptolemy I and his son would have promised to publish the secret literature of the three groups of citizens of Egypt (Egyptians, Greeks and Jews). So, for him, Hermetism is the Greek version of a redaction of Egyptian literature. Its form is Greek, but its contents would be Egyptian (the Septuagint being the equivalent Jewish redaction). Many hermetic texts were lost to Western culture during the Middle Ages but rediscovered in Byzantine copies and popularized in Italy during the Renaissance. The impetus for this revival came from the Latin translation by Marsilio Ficino, a member of the de' Medici court, who published a collection of thirteen tractates in 1471, as De potestate et sapientia Dei. The Hermetica provided a seminal impetus in the development of Renaissance thought and culture, having a profound impact on alchemy and modern magic as well as influencing philosophers such as Giordano Bruno and Pico della Mirandola, Ficino's student. This influence continued as late as the 17th century with authors such as Sir Thomas Browne. Although the most famous examples of Hermetic literature were products of Greek-speakers under Roman rule, the genre did not suddenly stop with the fall of the Empire but continued to be produced in Coptic, Syriac, Arabic, Armenian and Byzantine Greek. 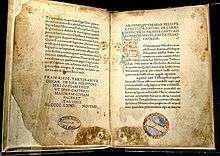 The most famous example of this later Hermetica is the Emerald Tablet, known from medieval Latin and Arabic manuscripts with a possible Syriac source. Little else of this rich literature is easily accessible to non-specialists. The mostly gnostic Nag Hammadi Library, discovered in 1945, also contained one previously unknown hermetic text called The Ogdoad and the Ennead, a description of a hermetic initiation into gnosis that has led to new perspectives on the nature of Hermetism as a whole, particularly due to the research of Jean-Pierre Mahé. John Everard's historically important 1650 translation into English of the Corpus Hermeticum, entitled The Divine Pymander in XVII books (London, 1650) was from Ficino's Latin translation; it is no longer considered reliable by scholars. The modern standard editions are the Budé edition by A. D. Nock and A.-J. Festugière (Greek and French, 1946, repr. 1991) and Brian P. Copenhaver (English, 1992). Corpus Hermeticum: first Latin edition, by Marsilio Ficino, 1471 CE, at the Bibliotheca Philosophica Hermetica, Amsterdam. ↑ One of the oldest surviving Hermetic manuscripts is the Papyrus Vindobonensis Graeca 29456, which dates to the end of the 2nd century AD. ↑ Broek, Roelof Van Den. "Gnosticism and Hermitism in Antiquity: Two Roads to Salvation." In Broek, Roelof Van Den, and Wouter J. Hanegraaff. 1998. Gnosis and Hermeticism From Antiquity to Modern Times. Albany: State University of New York Press. ↑ Jean-Pierre Mahé, "Preliminary Remarks on the Demotic "Book of Thoth" and the Greek Hermetica" Vigiliae Christianae 50.4 (1996:353-363) p.358f. ↑ See R. Jasnow and Karl-Th. Zausich, "A Book of Thoth?" (paper given at the 7th International Congress of Egyptologists: Cambridge, 3–9 September 1995). ↑ "Historical References in the Hermetic writings," Transactions of the Third International Congress of the History of Religions. Oxford I (1908) pp. 196-225 and Personal Religion in Egypt before Christianity. New York: Harpers (1909) pp. 85-91. ↑ Bernal, Martin, "Black Athena: The Afroasiatic Roots of Classical Civilization", volume I, p. 465. n. 48. ↑ "Ancient Egyptian Roots of the Principia Hermetica". ↑ Among the treasures of the Bibliotheca Philosophica Hermetica in Amsterdam is this Corpus Hermeticum as published in 1471. ↑ Mahé, Hermès en Haute Egypte 2 vols. (Quebec) 1978, 1982. Copenhaver, Brian P. (Editor). Hermetica: The Greek Corpus Hermeticum and the Latin Asclepius in a New English Translation, with Notes and Introduction (Cambridge) 1992. ISBN 0-521-42543-3 The standard English translation, based on the Budé edition of the Corpus (1946–54). Fowden, Garth, The Egyptian Hermes : a historical approach to the late pagan mind (Cambridge/New York : Cambridge University Press), 1986. Mead, G.R.S. (Translator) Thrice Great Hermes: Studies in Hellenistic Theosophy and Gnosis, Volume II (London: Theosophical Publishing Society), 1906.